A little luck and a lot of support are helping Larry Bobko finds joy in "a new normal." The keys to their new home had just changed hands. You could still hear the metallic clink. "We'd retired four days earlier, and moved to Arizona from the Midwest," says Teri Bobko. "And there was Larry—my healthy, busy husband—laying in the shade on the sidewalk." She thought he'd found a place to rest from the intense June heat. But Larry couldn't get up. Or speak. Teri's focus immediately turned from real estate to 911. And a short time later, at Dignity Health Mercy Gilbert Medical Center, she heard the shocking news: Larry had experienced a stroke, triggered by a blood clot in the left side of his brain. He could not speak, and the entire rightside of his body was paralyzed. The emergency room team offered Larry a clot-busting shot known as TpA, which has proven extremely effective in such emergency scenarios, but is not without its own set of risks, such as hemorrhage. "We've always been gamblers," Teri says, "and so I said, ‘We're going to givehim that shot!' And I'm so glad that we did." Minutes later, Larry was airlifted to Barrow Neurological Institute in Phoenix for specialty care. He spent four days in the intensive care unit and seven weeks at in-patient rehabilitation. 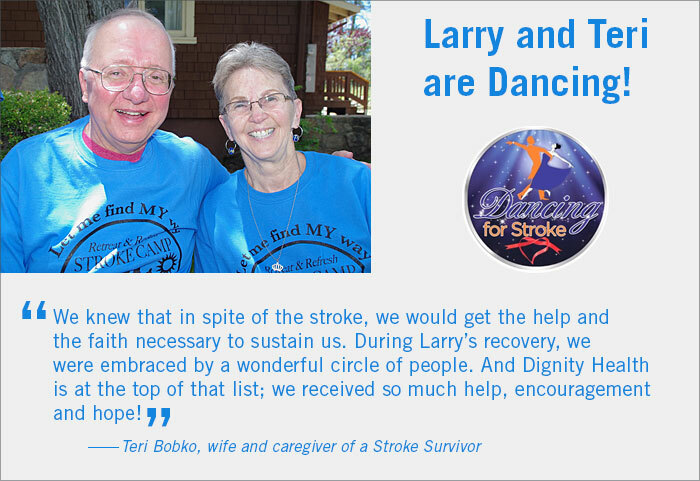 "The doctors had told us there was no way to know how many lost abilities Larry might regain," Teri recalls. "But right from the get-go,we received so much help and encouragement and hope. The therapist asked him, ‘Can you speak at all?' When Larry shook his head no, the therapist said, ‘Let's try a couple of things. A-B-C-D…'" "E-F-G," interrupted Larry. He and Teri were both stunned. "H-I-J-K-L-M-N-O-P!" The therapist beamed. "Next we tried numbers," Larry says. "She stopped me at 100." Reflecting on that moment, Teri says, "We knew that in spite of the stroke, we would get the help and the faith necessary to sustain us. During Larry's recovery, we were embraced by a wonderful circle of people. And Dignity Health is at the top of that list." Larry's therapy was intense: three hours a day, six days a week. During quiet moments, Larry would assess his progress and say to Teri, "If it never gets better than this, I'll be okay." Nine years later, he just keeps on getting better. 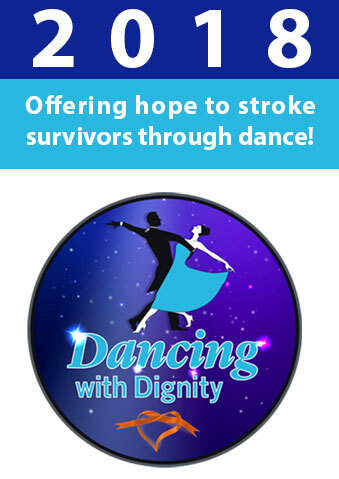 Teri and Larry both believe this is due in large part to a wide variety of stroke-related activities sponsored by Dignity Health that encourage them both: music therapy, camping trips, support groups, volunteer opportunities, and most recently, hippotherapy. "It means working with a horse," Larry explains. "At first it was kind of overwhelming. I didn't know what to expect, and the horse was so big." But soon enough Larry was riding in a variety of seated positions while playing catch or using his affected hand to place rings on goal posts. "It was so exciting, and so touching," Teri smiles. "I'm so proud of Larry for always going outside of his comfort zone to take on a new feat—and it always turns out for the best, both physically and emotionally, in the long run." "Since the stroke, I'm finding a new normal," Larry says. "And along with Teri, I'm able to give back to the stroke community." Among many endeavors, Larry participates in Ringers of Hope, in which stroke survivors play chime music at public events. He and Teri also do their best to give back to the community at large, such as by working with early readers in kindergarten once each week. "Dignity Health is helping me to do all of this," Larry says. "I'm incredibly grateful."